Tracing the marks of Christ in culture. This is the time of year in ministry when I'm on the road almost as much as at home. 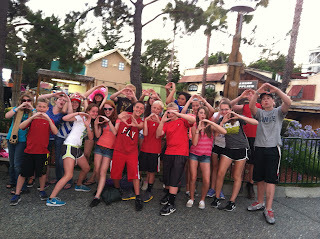 I don't think blogging has become enough of a habit yet to be sustained through the summer. See you in August sometime! 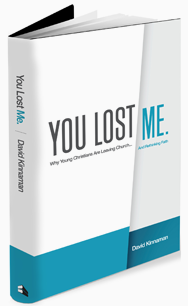 We've been exploring a new book on the decline of church participation among young adults: "You Lost Me: Why Young Christians are Leaving the Church," by David Kinnaman, president of the Barna Research Group. 1) The church needs to reconsider how we make disciples. Original Assumption: The church exists to prepare the next generation to fulfill God's purposes.New Thinking: The church is a partnership of generations fulfilling God's purposes in their time. My two cents: My congregation prioritizes age-niched ministry to children and youth. What are additional ways we can foster enduring 1 on 1 relationships between young people and adults? How might older generations receive the benefit of fresh perspective from the young, especially during this time of rapid cultural change? 2) We need to rediscover Christian calling and vocation. "Vocation is a clear mental picture of our role as Christ-followers in the world, of what we were put on earth to do as individuals and as a community...Despite years of church-based experiences and countless hours of Bible-centered teaching, millions of next-generation Christians have no idea that their faith connects to their life's work." My two cents: How about you? How might your work and service connect to the activity of God in our world? What does God want to accomplish through your occupation? 3) We need to reprioritize wisdom over information as we seek to know God. "Submerged as we are in a society that values fairness over justice, consuming over creating, fame over accomplishment, glamour over character, image over holiness, and entertainment over discernment, we need a blueprint for what life is meant to be. How can we live in-but-not-of lives in the world that surrounds us? In a culture skeptical of every kind of earthly authority, where information is dirt cheap and where institutions and leaders so often disappoint, we need God-given wisdom...Wisdom is the spiritual, mental, and emotional ability to relate rightly to God, to others, and to our culture." My two cents: How is wisdom acquired? What are church practices that foster wisdom? What gets in the way of wisdom? How would we teach our children differently if imparting wisdom, not information was primary? You Lost Me concludes with a final chapter that offers "50 ideas to find a generation," gathered from fifty pastors, authors, and leaders in the Christian community. Plenty to chew on there and a helpful indication that it will take all of us to envision faith and church in the emerging generations. I'm glad for the work Kinnaman and the Barna group have done here to give us the lay of the land. My hope and prayer is that in a few years, UnChristian and You Lost Me will be joined by a third book: I'm back, Baby! ...Or something like that. Hey Church, You Lost Me! Part 2. Hey Church, You Lost Me! Part 5. I Say You're a Dreamer, and I'm Not the Only One.